A remake of the SNES classic, Kirby Super Star Ultra features updated graphics including pre-rendered cutscenes that act as bookends to each stage. Though the black edges to these cutscenes are a tad unnecessary, their presentation is solid, as is the more clean and colorful look of the core gameplay which appears to run on the same engine as the GBA title Nightmare in Dreamland. The main game relies on the D-pad and buttons almost exclusively, retaining a very familiar control scheme, while the three minigames rely heavily on the stylus and touch screen. Two of these minigames, a shooting range and card matching, are very simple, requiring little more than quick reactions from players, while the third is slightly more involved as it demands players clear bugs and bombs off a conveyor belt feeding their respective Kirby. Meanwhile, the core game is comprised of nine different modes, the majority of which act as samplings of slight variations on the core Kirby formula. The SNES release of Super Star was most notable for its addition of copy abilities, which allowed Kirby to inhale certain enemies in order to gain new attacks including the Cutter, Yo-yo, Sword, Bomb, and many more. These abilities are both plentiful and nicely varied, and Kirby can even abandon his current ability to add a partner character to his side. Every partner character bears the appearance of whatever enemy Kirby originally copied, and bears their own health bar separate from Kirby’s. While Kirby can grab various food items to restore his own health, tapping the partner character will share the health regeneration with them. Aside from Gourmet Race’s fast-paced run against King Dedede to collect the most food items before crossing the finish line, the remaining five game modes are essentially quick snippets of what any other Kirby game would offer up. Meta Knight’s Revenge includes a countdown timer, making it arguably the most challenging of the lot, while The Great Cave Offensive is the complete opposite – a sluggish, time-consuming treasure hunt that lacks any real challenge, fun factor, or sense of fulfillment. Meta Knightmare Ultra offers up a retread of previous stages, allowing players to don the cape and faceplate of Meta Knight. It is the only one of major subgames that relies on the touch screen to activate Meta Knight’s abilities and attacks, each of which requires a different number of points gathered from defeated enemies. The stronger the enemies, the greater the number of points rewarded. The more powerful the attack, the greater the number of points required to activate it. The soundtrack of Super Star Ultra is generally quite good, though the quality of the tunes in The Great Cave Offensive sound quite rough on the DS hardware. Super Star Ultra is a decent remake – nothing more, and nothing less. It contains everything that led the original to be so well-loved, but the fact that it does very little to incorporate the DS’ touch controls is disappointing. 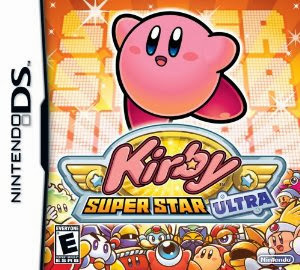 Because it is divided into many subgames, Super Star Ultra lacks any sense of exploration found in most other modern Kirby titles. While there are few Kirby games that ever feel too terribly challenging, Super Star Ultra is exceptionally easy from start to finish.